Quiet your spirit with the ancient practice of Zazen. In the quiet and stillness of a Buddhist temple, calm your heart and erase all of the negativity from your mind. The zazen experience is a great chance to learn about Japan's spiritual culture. In Shin-onsen's Antaiji Temple, the Soto sect of Buddhism has a zazen dojo where there is a german head priest. Amidst the misty mountain air, buddhist monks can often be seen practicing zazen in the fields of zazenso (a type of cabbage). The melting of winter and the blooming of spring comes late to this area, so there is a festival for the zazenso in April. The people of Yumura Onsen can be seen chatting along the river around sunset. Around 8 o'clock at night, there is a cool breeze and the city has a relaxing atmosphere. In summer, the night wind also brings the sound of the traditional Japanese bells which are hung outside. Around late July to late August, stores open late on the weekends. 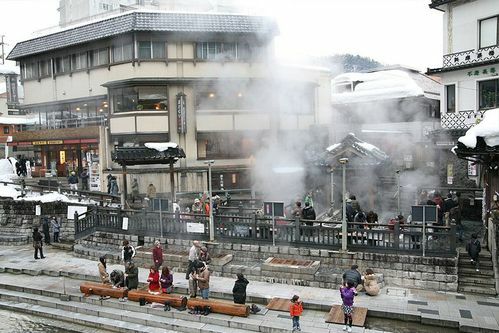 With stalls lined up from in front of Yakushi onsen, there are artists playing music and other attractions that locals and tourist both enjoy. 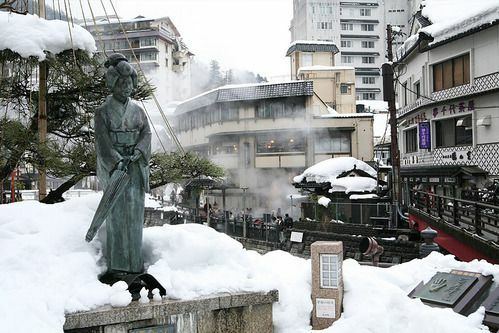 You can enjoy both the winter and summer of Japan in a traditional onsen town.